Lewis Hamilton has accused McLaren team-mate Fernando Alonso of unfair driving during the Belgian Grand Prix. Hamilton was upset the double world champion forced him off the track as they disputed third place at the start. "He has gone and swiped me and pushed me as wide as he could," said Hamilton. "I was just really lucky there was a run-off area so I could take that." Asked if he thought the move was hard but fair, the 22-year-old Briton said: "I wouldn't say fair, but it was hard." Hamilton effectively accused Alonso of double standards, saying the Spaniard is "always complaining about people doing unfair manoeuvres". The championship leader, who finished fourth at Spa, added: "We all had equal starts, perhaps a little bit better for me than for Fernando. "I braked quite late and was on the outside quite close to the Ferraris. I started to accelerate and all of a sudden Fernando came sweeping across me, and he knew I was there. "I don't know whether I was ahead but there was enough room for us all to get round fair and square." Hamilton was able to continue his battle with Alonso on the run down to the 180mph Eau Rouge corner, which the two entered side-by-side. "At Eau Rouge it's impossible to take two Formula One cars through there without taking each other out, so I just lifted," said Hamilton. "Eau Rouge is always going to be a tricky one. He had the momentum on me and was a bit quicker. "It would probably have been stupid of me just to keep it flat, although I was very tempted. It worked in Formula Three in the wet but I don't think it would work in an F1 car." Alonso said he had been blocked by Felipe Massa's Ferrari going into the first corner and that he went to the outside of the track to defend his position. Alonso made an aggressive block on Lewis and now he's being called dangerous, when Lewis has done it previously he's called brave. Is there one rule for one and one for the other? "I was blocked on the inside and I had no space," said the reigning world champion. "The first corner is a bit more tricky as it is 180 degrees, so there are many possibilities for the racing line out of it. "Lewis ran a little wide, so he took a little bit of an advantage, and we arrived wheel to wheel into turns three and four. I was lucky to be on the inside to keep the position there." McLaren team boss Ron Dennis said he was "pretty relaxed" about the incident. "They were just pushing hard on each other," he said. "I don't have a position on fairness. "They were just pushing hard and they are fighting for the world championship. They didn't touch. They didn't fall off at the end of the day." 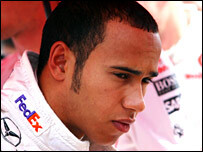 Hamilton also questioned Alonso's loyalty to the McLaren team after a testing week. The Spaniard opted to travel to Spa instead of attending the 'spygate' hearing in Paris, where McLaren were handed a £50m fine and stripped of their constructors' points. Hamilton, on the other hand, travelled to France to show his support for the team. "It's been a tough week, for sure a lot tougher week for me than for Fernando because... I won't say any more," he said. "I feel more attached to the team, I guess, and I care a bit more."